Perhaps they heard the considerable amount of whispering that they had gone soft. Perhaps they sat back gathering steam while their contemporary protégés, Mastodon and Isis, garnered more widespread acclaim and were said to have become the kings of the genre by a few people I know. 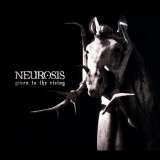 Whatever the real reason, Neurosis are back and they are angry, at least musically. Their latest release, Given to the Rising, is the band’s heaviest and darkest since 1999’s Times of Grace. Before we get to the meat of the album, I must give credit to the superb sound engineering work of Steve Albini. Steve is the frontman of indie legends Shellac, a musical equipment genius, and has offered his production hand to everyone from High on Fire to Nirvana. He has also produced every Neurosis album from the aforementioned Times of Grace onward, and really brings out the best aspects of the band’s sound. As with most of his other work, the guitars on Given to the Rising have a huge, lush sound and the drums are loud and mesmerizing. I began listening to the opening title track fully expecting to hear a soft, brooding intro such as the one found on The Eye of Every Storm, which I have no problem with. What I got was a loud charging beast of a riff that brought a smile to my face. Basically, it takes less than one second for Neurosis to let you know that there is an altogether different attitude found on Given to the Rising. This is about as loud and aggressive as they can be, though this song has its share of softer valley-like portions amongst the chaotic riffs to give its nine minute run length a much shorter feel. Fear and Sickness follows an eerie intro with an almost groove-paced bell curve sounding rhythm section. The chorus is so heavy and bass drenched that it literally blew out the speakers in my truck the first time I listened to it. Steve Von Till, who has all but assumed sole vocal duties as far as my ears can discern, belts out deep and tortured scowls in addition to some amazing drum work from Jason Roeder. To the Wind is the real showcase of just how expansive the Neurosis repertoire can be. A calming post rock passage lasting about 2 minutes is only the beginning. The middle is chock full of the furious riffing and unique drumming fans of the band are more than used to, but the real apex is the closing few minutes. An abrupt end to the center riffing sees Von Till speaking a deep vocal over ambient noise, before belting out a sustained, distorted scream that becomes the meat of one the gigantic walls of sound that this band loves to unleash. This is truly an outstanding track, and probably the best on the album. Given to the Rising definitely has its fair share of the kind of song structures you would expect from Neurosis, namely the quiet and dark intro followed by loud and chaotic sections, as heard on End of the Road (listen for the rare Scott Kelly vocal appearance). Despite this, you still get the feeling that the band is more than willing to throw in an experiment here and there, such as the two short ambient spoken word passages, Shadow and Nine. Both are really nothing more than a bridge between songs (call it filler if you will), but the lyrics coupled with Von Till’s chilling deep voice give them an interesting quality. Water is Not Enough was the first taste of this album that most received, myself included. I loved it on first listen and I would still consider it one of the best on the album. The muted riff that dominates most of the first half is hypnotic, and Von Till’s crackled grunts over the ultra-heavy guitars of the chorus are some of the more emotional ones he has done. The knifing riff surrounded by Noah Landis' beautiful ambient mess at the close seals the deal. In the interest of keeping this from becoming a novel, I won’t go into great detail with the remaining tracks I haven’t touched on, though they are both great on their own merit. Distill (The Swarm) is aptly titled as it contains a distortion soaked riff that has a palpable swarming quality to it. Origin builds at a suffocating and slow pace for around 8 minutes leading to a dense closing crescendo of encompassing heavy riffs and pounding drum fills. Given to the Rising is up there with the best of the Neurosis catalogue in my opinion. It is assuredly more dark and sinister sounding than their recent output, though there are still elements of those releases that can be found here. Perhaps I’m being nitpicky, but I would have liked to hear more of Scott Kelly’s vocals, but that is more personal preference and not a blemish on this outstanding effort. With this release, Neurosis have once again set the bar for the rest of the sludge genre, this time to a seemingly unattainable level.